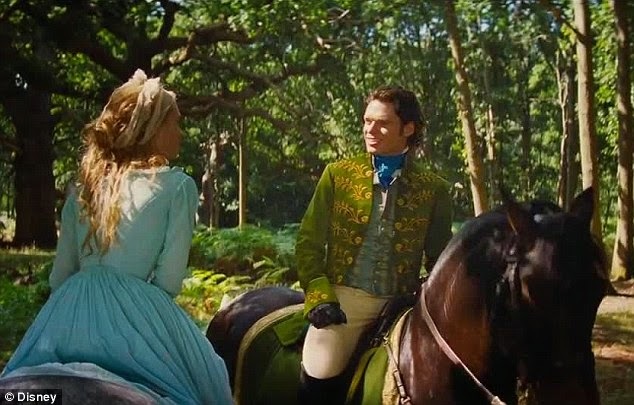 Now there's an idea: put Cinderella and the entire cast on horses. That would be a different story. Or would it? I suppose if you stick to the classic tale, they'd still ride off into the sunset together. I know I'm not the only one who wishes Kenneth Branagh had taken a slightly more revisionist look at this old fairytale; one that ended not just with marriage to a prince, but one that gave us a more rebellious, more fully evolved Cinderella. What we got was basically the same old 'and they lived happily ever after' story. Okay, enough kvetching. I've been over what bugged me about the movie a couple of times—you can catch up, if you care to, with my post Cinderella: 5 Things I Loved, 5 Things I Didn't — and now it's time to move on! But being that it's my Slacker Sunday, the day where instead of spending far too much time on this little blog — it's become more of an obsession than a hobby — I roll over and go back to sleep or grab another cup of coffee and focus on Meet the Press; if you don't mind I'm going to share the New York Times Anatomy of a Scene featuring director Kenneth Branagh discussing the meeting of Cinderella and the Prince. Unlike the traditional story the famous couple meet before the ball in Branagh's version. I guess that's something. It is a beautiful setting; as Branagh says, there's something magical about having these two gorgeous young people meet on horseback, surrounded by 600 year old trees, trees older than Shakespeare.